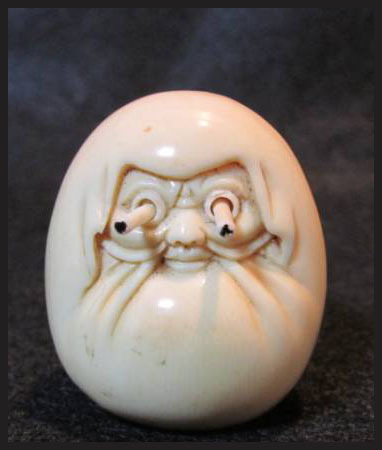 do you know anything about small celluloid figures that depict scenes from Japan? I have collected 14 or so, the most common seems to be a geisha in a ricksha pulled by a man, other common themes are boats containing geisha or the immortals, and I have one wonderful one showing a man walking on a waterwheel to turn it and a woman carrying a yoke over one shoulder with buckets hanging from it. or do they have some function in Japanese culture, on girl's day, perhaps? The little stick-eyes that go in and out are what make Kobe charms Kobe charms. They are named after the old Japanese Kobe toys that had mechanical features.
. Kobe dolls and Food . 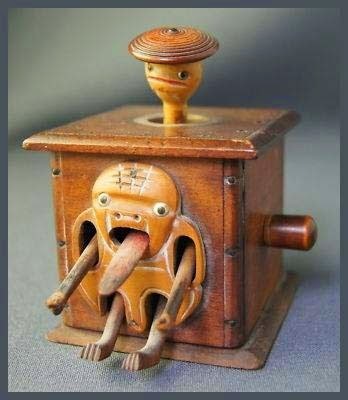 These automata were first made between 1870 - 1920 at the port city of Kobe and sold along the docks as a cheap sailor's souvenir. All Kobe have moveable parts - eyes, tongues, heads, etc. These toys were activated by a knob on the side of a box containing the mechanism (older dolls had hand-crafted mechanisms). They play musical instruments, do gymnastics, drink sake, and etc. These are all hand-crafted one-of-a-kinds. These figures have moon shaped faces and are created from polished ebony or blackened wood with pieces of bone or ivory accents. They may represent or be inspired by the black sailors who first arrived at Kobe around 1868. Rarely you can see a "blonde" wood version of a Kobe doll. These are tiny toys! 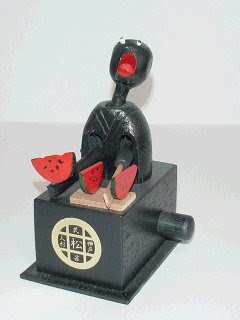 The largest known Kobe toy is 6-1/2" long and has 12 animated functions. 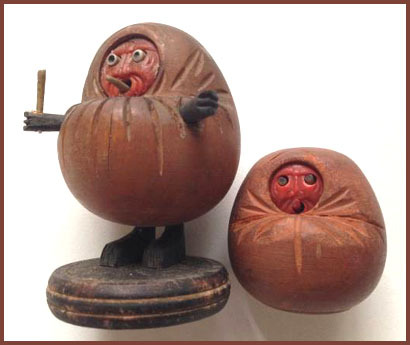 The early, hand-crafted Kobe toys up to c 1920 are the rarest and most valuable. 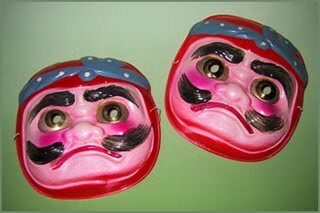 Kobe toys were copied during the 1920's and 1930's by manufacturers/ importers and these are still collectible but not as finely made so therefore they are less rare and less desirable. Less valuable are the more modern manufactured copies. Collection of wooden and celluloid dolls from after WW2. When celluloid was invented and first came to prominence in the 1870s, dolls were nearly all breakable and fragile--bisque and china dolls were easily shattered and papier mache and wax easily ruined. So, it wasn't a surprise that doll companies started experimenting with celluloid to mold dolls rather early on. By the early 1900s, celluloid dolls were plentiful, since celluloid was easily molded and generally inexpensive. Celluloid dolls can vary in size from only an inch or two tall to as large as 30" for large Japanese celluloid baby or toddler dolls. However, most celluloid dolls tend to be smaller dolls due to the lightweight nature of the plastic and also due to its fragility. Companies in Germany, France, Italy, Japan and the United States are among the hundreds that have produced celluloid dolls. Most Japanese celluloid doll makers focused on mass producing small, inexpensive carnival- type dolls, so it isn‘t very often that collectors find good quality sturdy examples of babies or toddlers. There were a few firms, however, that made a limited quantity, and although these cannot compare with the high quality of French and German baby dolls from the same period, they do deserve to be recognized. 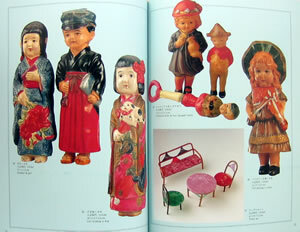 Sekiguchi was one of the largest and most prolific manufacturers of celluloid toys in Japan. The company was founded in 1918 by Moto and Tomokichi Sekiguchi for the sole purpose of manufacturing and exporting dolls to the United States. Their most recognized creation is a variation of the Kewpie, which they called Cupid. Later, during the 1920s, the naked carnival type Boopie doll became popular. 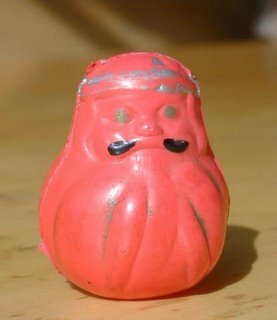 Often these were decorated with brightly colored feathers or crepe paper costumes and exported in great number to the United States where they sold for mere pennies. 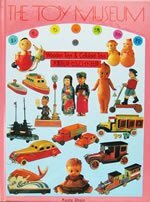 On occasion, sturdy Japanese toddler or baby dolls can be found with the trademarks of Sekiguchi (a three lobed flower) the Royal Company, Ltd. (a fleur-de-lis) and Sato Sankichi (SS inside rhombus). Often these are made in the likeness of Baby John, a doll which became so popular it was produced in a variety of sizes by a number of different manufacturers. Kobe dolls are renowned for being bizarre but cute (“kimokawa”) and are even sometimes called "ghost dolls" as often they are used to represent such otherworldly spirits. The creepy mechanical dolls date to the Meiji Era (1868-1912) but went into decline after the Great Hanshin Earthquake devastated the port city of Kobe in 1995. 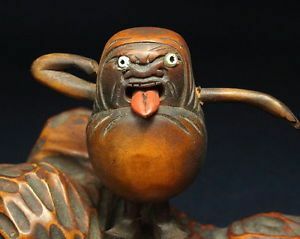 An exhibition featuring hundreds of them is being held at the Japan Toy Museum in nearby Himeji as part of an effort to bring them back in the public eye. While Hyakkido Noguchi is believed to be the first to make one, Fusamatsu Desaki is also famous for his creations. Tashiro Oda is said to have expanded sales of the doll overseas, while Masaatsu Kazuoka was a leading artist in the field after the end of World War II. 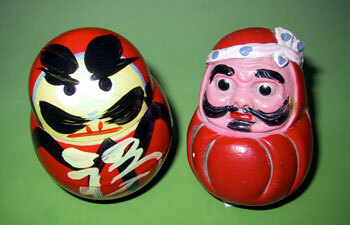 Many Kobe dolls have bald heads and their wide-open eyes are spaced far apart. They typically have unusually long necks and are also characterized by a certain activity, such as eating a watermelon or drinking alcohol.